Lots of games claim to have a cult following, but it doesn’t get more cult than Katamari Damacy. Initially released on the PS2, the colorful arcade title put players in control of a little green fellow who had to push a Katamari – a spherical object – around and roll all sorts of objects into it. As the ball got bigger, the score got higher. Katamari definitely got more regard because it was so outlandish. It was filled with bright colors and rainbows, and the story and dialogue were patently absurd. Some kind of cosmic king knocked out the stars so you need to create new ones by bunching up all sorts of household objects. The thing is Katamari had sequels on various consoles, but it never hit PC. Katamari Damacy is the series’ first outing on the PC, and it’s been a long time coming. So how does Katamari stack up after all this anticipation as Katamari Damacy REROLL? Well, the first thing to note is that Katamari Damacy REROLL has a very unique control scheme. You need to push both analog sticks in a direction to move. If you move just one analog stick, you rotate around the ball. You can also boost and change direction with the sticks. This is all covered in the game’s intro tutorial, and you get the hang of things pretty quickly. As for the core gameplay, Katamari Damacy REROLL requires a fair bit of patience. As your Katamari rolls up lots of other objects it becomes bigger and more unwieldy, and you need to focus. The rule of thumb when rolling over objects and adding them to your Katamari is that the object has to be smaller than you are. This rule is one that felt pretty inconsistent and arbitrary, as most of the time it felt like the Katamari had grown enough. I later learned that it’s not just about how large your Katamari appears; it’s also based on the weight and the surface area. But on the whole, the game is pretty intuitive. I’d say one of the biggest issues with Katamari is that the gameplay never really evolves. It’s a really simple game on the whole, and for the most part you’re just trying to roll up bigger piles of junk in less time. This is an issue about an hour or so in, as it feels like you’ve already seen most of what the game has to offer. I’d say when the scale gets much bigger the game does eventually become a lot wackier. One of the most entertaining things about Katamari is the fact that while you start the level as a little ball, by the end of it you’re basically an orb of chaos, rolling into everything and becoming bigger and bigger. The camera shifts perspective along with your size increase, and so by the end of it the levels feel a lot smaller by comparison. But again, Katamari Damacy REROLL kind of suffers from a lack of variety beyond its core concept. It is an arcade game in a strong sense of the word, and you’re definitely going to enjoy it more if you’re the type of gamer who tries to get the highest rank possible. I’d say it was very wise of Namco Bandai to put this game out for $30 on PC, as that’s a solid price range for the amount of content you’re getting here. I’d also reason that the Nintendo Switch version is even cooler because it offers portable arcade fun. Katamari Damacy REROLL was reviewed using a PC downloadable code of the game provided by Bandai Namco. The game was tested on a machine running Windows 10, with an 8GB NVIDIA Geforce GTX 1070 fitted on a 4th Generation Intel i7 4790 3.6Ghz CPU and topped with 16GB of RAM. 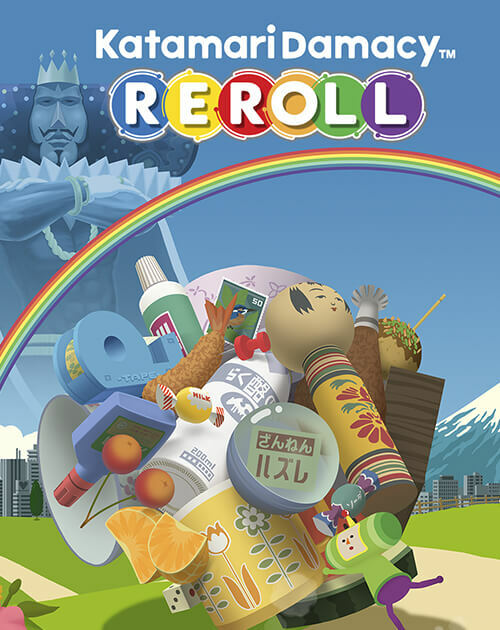 Katamari Damacy REROLL is also available on Nintendo SwitchP via digital and retail store releases. We don’t discuss review scores with publishers or developers prior to the review being published (click here for more information about our review policy).